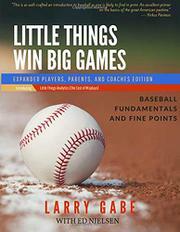 A comprehensive instructional manual for the game of baseball. Baseball is a complex, nuanced sport, and it’s best if a player starts young, when he or she can focus on the fundamentals. In his debut, Gabe walks readers through the various components of the game, discussing the basic aspects of every position, and then provides insights into other key elements, such as sliding and bunting. His instruction is clear and always focuses on foundations that, when perfected, may provide a player with a competitive advantage over his or her peers. The book accompanies each lesson with helpful pictures, which are particularly indispensable when teaching such things as proper hitting stance. It’s impressively comprehensive, covering everything from proper infielder footwork to the mechanics of pitching. Gabe repeatedly returns to the psychological aspect of the game; at one point, he describes a player’s proper mental comportment as a combination of intense focus and an unrelenting desire to win: “The killer instinct is a tool you need to use daily, even in batting practice. It brings your concentration up to another level.” The author also includes some thoughts on physical conditioning, particularly plyometric exercises, and offers some trenchant insights into how the game has changed since his days as an amateur player. Pitchers simply throw the ball faster now, he says, and the elusive genius of the fastball is now a learnable skill with targeted training. Overall, Gabe consistently writes with clarity and patience. However, something as complicated as hitting a baseball—the “hardest thing to do in sports”—is exceedingly difficult to learn from a book, however artfully fashioned. Ultimately, this work shouldn’t be construed as a substitute for training under an experienced coach. In fact, one could argue that it’s best as a manual for coaches themselves, to ensure that they have enough knowledge of the sport’s underpinnings to teach newcomers. Still, this is as well-crafted an introduction to baseball as one is likely to find in print. An excellent primer on the basics of the great American pastime.